Something I like, which I suspect nobody other than a gardener would understand, is visiting other countries and finding the wild versions of garden plants. The Himalayas in Nepal might have been the most exotic example, with wild berberis, pieris and azalea, but just today while hiking up Mostnice Gorge in the Slovenian Alps I found hellebores, aconites, cyclamen, periwinkles, anemones, irises and euphorbia. I have to add that the Mostnice Gorge is very well named, because nobody could possibly resist such an obvious pun. 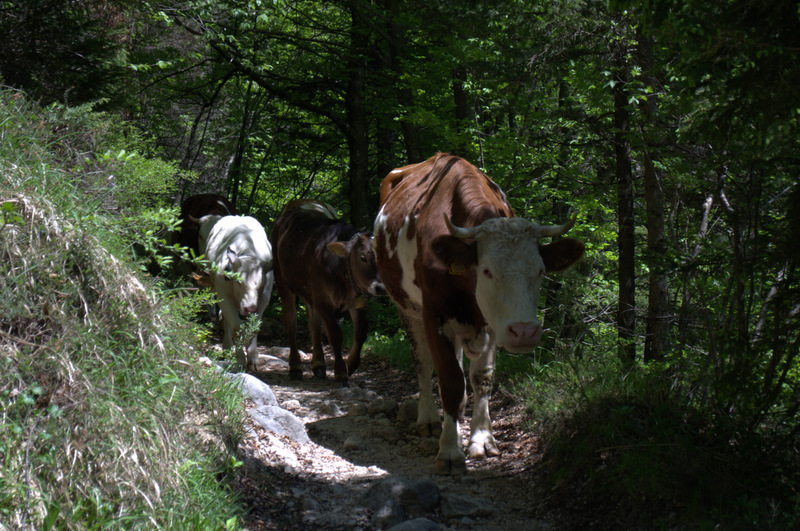 It was just a little alarming to encounter an oncoming herd of cows on a narrow path with a cliff to the left and a drop to the right, but at least their bells gave some warning and we squeezed ourselves into a nook while they passed! 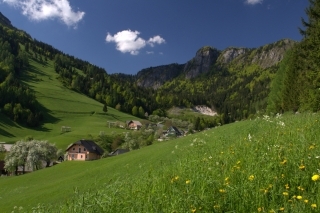 I like the Slovenian countryside, and the Slovenian habit of letting grass grow long. Whether it’s the flower-strewn hay meadows that cover whole hillsides and appear as little glades within verdant forests, or roadside verges and front gardens left with shaggy coats that have more colour and softness than a strict green close-cropped English lawn. I like getting away from the obvious sights. Lake Bled is the number one tourist draw in Slovenia, an admittedly chocolate-box view of a blue lake with a castle perched on a forested bluff above it, a church on a little island in the lake for good measure. But I must admit that after pausing to take a photo I didn’t feel any urge to linger, and we drove off to walk up two stunning little gorges in the Slovenian Alps. 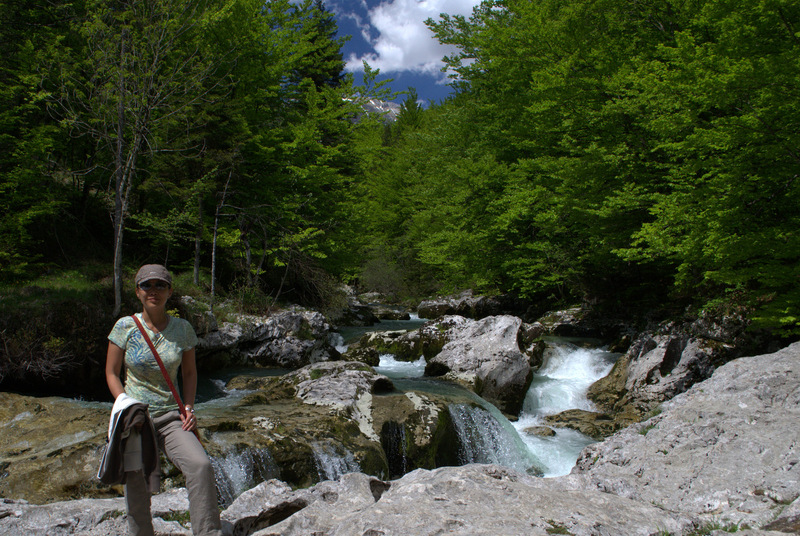 After that we visited the much larger Lake Bohinj, also picturesque and probably lovely to hike around if we’d had time. Best of all was driving up a snaking mountain road from the lake and taking a different route back to Ljubljana; meadows and forests in steep-sided valleys like a backdrop from The Sound of Music, just ordinary Slovenian scenes away from the city. I like small cities. I like that they are cities, and have the facilities to go with it, and I like that they are small, so that everything is walkable and the geography easily grasped by a newcomer. Bath, Bergen, Fremantle, Cuenca, Queenstown, and of course Ljubljana. The old town is so small that you could blink and miss it, but the whole area on either side of the river is beautiful and scattered with enticing cafes, bars and eateries. Five minutes’ walk from the old town is a residential district of market gardeners, where all the houses have vegetable plots attached. The castle that looms above has been converted to modern use; concerts, restaurants, conference venue, but it’s well done and the view from the watchtower over the city is a stunner. We’re here on a whistle-stop, but I reckon I could chill out in Ljubljana for a few days without losing interest. This entry was posted on Saturday, May 18th, 2013 at 3:14 pm	and is filed under Slovenia. You can follow any responses to this entry through the RSS 2.0 feed. You can leave a response, or trackback from your own site.